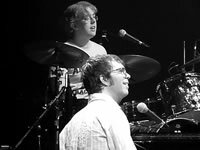 Drummer Sam Smith will once again be seizing the sticks as Ben Folds tours the states (and Canada!) in Spring. Lindsay Jamieson had to pull out of the European tour at the last minute due to a neck injury, by which point Sam had about three days to learn Ben's catalogue. He certainly rose to the challenge, playing twelve storming shows as well as taking backing vocals on GMTV (heh heh). Catch him at any one (or more) of these shows. I'm putting them up as they appear, so keep checking back.